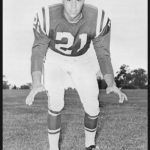 In November 2015 a wrongful death law suit was filed against the NFL by Arthur DeCarlo Jr., son of Arthur “Art” DeCarlo Sr., who was a defensive back in the NFL from 1953 through 1960. Drafted by the Chicago Bears in 1953, DeCarlo Sr. was quickly traded to the Pittsburgh Steelers where he played for a year prior to enlistment in the Army. While still in the Army, his contract was traded to the Washington Redskins. Afterward, he finished his NFL career playing for the Baltimore Colts from 1957 – 1960. “DeCarlo was exposed to numerous concussive and sub-concussive blows throughout his NFL career, [including] . . . loss-of-consciousness concussions where DeCarlo was subsequently returned to game play within the same game, within several plays of having been rendered unconscious,” states DeCarlo Jr., in the lawsuit.